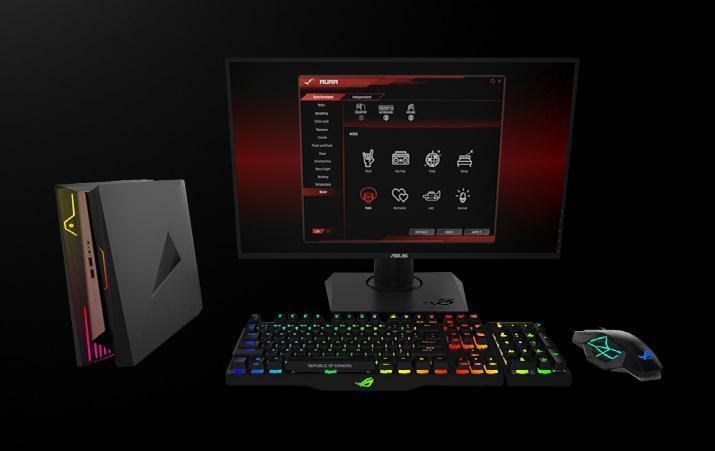 ROG GR8 II is a console-sized gaming PC designed for unstoppable gaming and VR experiences. It redefines PC gaming by allowing gamers to take full-gaming desktop-grade performance everywhere they go. GR8 II features powerful desktop-grade components including a full-sized custom ASUS GeForce GTX 1060 graphics card and up to a 65W 7th Generation Intel Core i7 processor with 32GB DDR4 memory. In testing , GR8 II performed 47% better than similar GTX 960-equipped gaming PCs and 10% better than GTX 970-equipped gaming PCs. It ran Overwatch® in 2K and Full HD resolutions at frame rates averaging 70fps. The 7th Generation Intel Core i7 processor provides unprecedented levels of gaming and multi-tasking performance, with an 8% performance boost versus the previous generation, and decreases frame rendering latency during VR gaming. GR8 II has been extensively tested to ensure it meets the recommended specifications required to power Oculus Rift. It has a VR-friendly design with two HDMI ports to connect a VR headset and display simultaneously. Gamers can also hook up two displays via HDMI for their Twitch streams and chat rooms, or play games on up to three HD displays through DisplayPort. In addition, GR8 II supports 4K UHD (3840 x 2160) displays and features NVIDIA G-SYNC™ technology. NVIDIA G-SYNC synchronizes the display's refresh rate with GR8 II's GeForce GTX graphics card to minimize lag and eliminate frame-rate stutter and visual tearing for ultra-smooth visuals. ROG GR8 II can be specified with an M.2 PCI Express® or SATA solid-state drive (SSD) and a 2.5-inch hard disk drive to give gamers the speed afforded by the M.2 SSD and the large storage capacities offered by the 2.5-inch HDD. Simple slide-off covers provide easy access to the additional 2.5-inch HDD/SSD storage bay for quick upgrades. Wi-Fi with 2x2 dual-band 2.4/5GHz antennas offer up to 867Mbps transfer speeds, while the very latest MIMO technology ensures that every connected user experiences the fastest wireless and online speeds.